Not to be confused with Cosby or The Bill Cosby Show. The Cosby Show is an American television sitcom co-created and starring Bill Cosby, which aired for eight seasons on NBC from September 20, 1984, until April 30, 1992. The show focuses on the Huxtable family, an upper middle-class African-American family living in Brooklyn, New York. The Cosby Show spent five consecutive seasons as the number-one rated show on television. The Cosby Show and All in the Family are the only sitcoms in the history of the Nielsen ratings to be the number-one show for five seasons. It spent all eight of its seasons in the top 20. According to TV Guide, the show "was TV's biggest hit in the 1980s, and almost single-handedly revived the sitcom genre and NBC's ratings fortunes." TV Guide also ranked it 28th on their list of 50 Greatest Shows. In addition, Cliff Huxtable was named as the "Greatest Television Dad". In May 1992, Entertainment Weekly stated that The Cosby Show helped to make possible a larger variety of shows with a predominantly African-American cast, from In Living Color to The Fresh Prince of Bel-Air. The Cosby Show was based on comedy routines in Cosby's stand-up act, which in turn were based on his family life. The show led to the spinoff A Different World, which ran for six seasons from 1987 to 1993. The show focuses on the Huxtable family, an upper middle-class African-American family, living in a brownstone in Brooklyn Heights, New York, at 10 Stigwood Avenue. The patriarch is Cliff Huxtable, an obstetrician and son of a prominent jazz trombonist. The matriarch is his wife, attorney Clair Huxtable. They have four daughters and one son: Sondra, Denise, Theo, Vanessa, and Rudy. Despite its comedic tone, the show sometimes involves serious subjects, like Theo's experiences dealing with dyslexia, inspired by Cosby's dyslexic son, Ennis. The show also deals with teen pregnancy when Denise's friend, Veronica (Lela Rochon), becomes pregnant. The Cosby Show pilot episode uses the same title sequence as the rest of the first season, and is widely regarded as the first episode. However, it is notable for a number of differences from the remainder of the series. In the pilot, the Huxtables have only four children. Following the pilot, the Huxtables have five children, with the addition of their eldest daughter, Sondra (Sabrina Le Beauf), who is mentioned in episode four and appears first in episode 11. The character was created when Bill Cosby wanted the show to express the accomplishment of successfully raising a child (i.e., a college graduate). Bill Cosby originally wanted Vanessa L. Williams to play the part of "Sondra" due to her college education and background in theater arts. However, Williams was recently crowned the first black Miss America and pageant officials would not permit her to play, the Cosby Show role, while she was representing the Miss America pageant. Whitney Houston was considered for the role of Sondra Huxtable. Houston, however, was unable to commit to the full-time television production schedule in the NBC contract, as she was intending to be a full-time music recording artist. Most of the story in the pilot presentation is taken from Bill Cosby's classic comedy film Bill Cosby: Himself. Cosby's character is called "Clifford" in the early episodes of the first season (as evidenced by his name plate on the exterior of the Huxtable home). His name was later switched to "Heathcliff". Although, in one episode, Clair calls him "Heathclifford". Additionally, Vanessa refers to Theo as "Teddy" twice in the dining room scene. The interior of the Huxtables' home features an entirely different living room from subsequent episodes, and different color schemes in the dining room and the master bedroom. Throughout the remainder of the series, the dining room is reserved for more formal occasions. In the early 1980s, Marcy Carsey and Tom Werner, two former executives at ABC, left the network to start their own production company. At ABC, they had overseen sitcoms such as Mork & Mindy, Three's Company, and Welcome Back, Kotter. The two decided that to get a sitcom to sell for their fledgling company, they needed a big name behind it. Bill Cosby, who starred in two failed sitcoms during the 1970s, produced award-winning stand-up comedy albums, and had roles in several different films, was relatively quiet during the early 1980s. According to a Chicago Tribune article from July, 1985, despite Carsey and Werner's connection to the network, Lewis Erlicht, president of ABC Entertainment, passed on the show, prompting a pitch to rival network, NBC. Outside of his work on his cartoon series Fat Albert and the Cosby Kids, Cosby was doing little in film or television, but Carsey and Werner were fans of Cosby's stand-up comedy and thought it would be the perfect material for a family sitcom. Cosby originally proposed that the couple should both have blue-collar jobs, with the father a limousine driver, who owned his own car, and the mother an electrician. With advice from his wife Camille Cosby, though, the concept was changed so that the family was well-off financially, with the mother a lawyer and the father a physician. Cosby wanted the program to be educational, reflecting his own background in education. He also insisted that the program be taped in New York City instead of Los Angeles, where most television programs were taped. The Huxtable home exterior was filmed at 10 St. Luke's Place near 7th Avenue in Manhattan's Greenwich Village (although in the show, the residence was the fictional "10 Stigwood Avenue"). The earliest episodes of the series were videotaped at NBC's Brooklyn studios (now owned by JC Studios). The network later sold that building, and production moved to the Kaufman Astoria Studios in Queens. Even though the show was set to take place in Brooklyn, the exterior façade was actually of a brownstone townhouse located in Manhattan's Greenwich Village at 10 Leroy Street/ 10 St. Luke's Place. The pilot was filmed in May 1984, with season one's production commencing in July 1984, and the first taping on August 1, 1984 (Goodbye Mr. Goldfish). During its original run on NBC, it was one of five successful sitcoms on the network that featured predominantly African-American casts. The other sitcoms were 227 (1985–90), Amen (1986–91), Cosby Show spin-off A Different World (1987–93), and The Fresh Prince of Bel-Air (1990–96). Five other NBC sitcoms of that time also featured black actors and actresses in lead starring or supporting roles — Nell Carter and Telma Hopkins on Gimme a Break (1981−87); Leonard Lightfoot, and later Franklyn Seales and Alfonso Ribeiro on Silver Spoons (1982−86), Cherie Johnson on Punky Brewster (1984-88), Kim Fields on The Facts of Life (1979−88), and Gary Coleman and Todd Bridges on Diff'rent Strokes (1978–85). Although the cast and characters were predominantly African American, the program was unusual in that issues of race were rarely mentioned when compared to other situation comedies of the time, such as The Jeffersons. However, The Cosby Show had African-American themes, such as the Civil Rights Movement, and it frequently promoted African-American and African culture represented by artists and musicians such as Jacob Lawrence, Miles Davis, James Brown, B.B. King, Stevie Wonder, Sammy Davis, Jr., Lena Horne, Duke Ellington, Dizzy Gillespie, and Miriam Makeba. The show's spin off, A Different World, dealt with issues of race more often. The series finale (taped on March 6, 1992) aired during the 1992 Los Angeles riots, with Cosby quoted in media at the time pleading for peace. During the third season of the show, actress Phylicia Rashad was pregnant with her daughter Condola Rashād. Rather than write this pregnancy into the character of Claire Huxtable, the producers simply greatly reduced Rashad's scenes or filmed in such a way that her pregnancy was not noticeable. Another pregnancy of one of the main stars, that of Lisa Bonet, almost caused the actress to be fired, especially coming in the wake of appearing in the film Angel Heart, which contained graphic sexual scenes with actor Mickey Rourke. Bill Cosby strongly disapproved of Bonet appearing in the film, but she was allowed to retain her role on A Different World until returning to The Cosby Show after her pregnancy. Tensions remained, however, and Bonet was eventually fired from the show in April 1991. The show's theme music, "Kiss Me", was composed by Stu Gardner and Bill Cosby. Seven versions of this theme were used during the run of the series, making it one of the few television series to use multiple versions of the same theme song over the course of a series. For season four, the theme song music was performed by musician Bobby McFerrin. Due to legal complications regarding the background mural, the opening for season seven (filmed in August 1990) was replaced with the one from the previous season. The original season-seven opening, with slight modifications, returned to use in the beginning of season eight. *Phylicia Rashad was credited as "Phylicia Ayers-Allen" during season one and the first fourteen episodes of season two. +Prior to joining the cast as a regular, Joseph C. Phillips appears as Daryl, a potential boyfriend for Sondra in season two (episode: "Cliff in Love"). The show's portrayal of a successful, stable black family was praised by some for breaking racial stereotypes and showing another part of the African-American experience. However, it was criticized by others, including Henry Louis Gates, for allowing white audiences to think that racism and poverty were problems of the past. As a result of the sexual assault allegations against Cosby, Malcolm-Jamal Warner has stated that the show's legacy is "tarnished". The Cosby Show had generated $2.5 billion in television revenue, including $1 billion from TV advertising, and $1.5 billion from syndication. The Cosby Show aired on Thursdays at 8:00 pm for all eight seasons. In its first season, the show was the beginning of a Thursday NBC schedule that was followed by Family Ties, Cheers, Night Court, and Hill Street Blues. The Cosby Show is one of three television programs (All in the Family and American Idol being the others) that were number one in the Nielsen ratings for five consecutive seasons. Carsey-Werner handles domestic distribution, while CBS Television Distribution handles international distribution of the series, and has done so since 1997. In the United States, The Cosby Show began its television syndication run in September 1988 in broadcast syndication, shortly before the show's fifth-season premiere, and was at the time distributed by Viacom; many stations that carried the series were Big Three network affiliates. As time went on, this moved to lower-profile timeslots and other independent stations and minor network affiliates. Fort Worth, Texas-based independent station, KTVT, carried the series until 1995, when it ceased operating as a regional cable superstation and became an affiliate of CBS. TBS, then a national cable superstation, carried the series for nearly a decade beginning in 1999. Fellow superstation WGN America began carrying the series shortly thereafter, and continued to until September 2010. Viacom's Nick at Nite began airing reruns of the series in March 2002, and its sister network TV Land began airing reruns in 2004, making The Cosby Show one of the few series that were shown on both Nick at Nite and TV Land at the same time. Reruns of The Cosby Show have been pulled from several networks and venues as a result of Cosby's eventual conviction for sexual assault. In November 2014, TV Land pulled the series from its lineup. In December 2014, the Magic Johnson-owned network Aspire removed the show from its lineup. BET's Centric (another Viacom unit) stopped airing reruns of The Cosby Show. At the same time, barter syndicator The Program Exchange ceased distributing the latter show. Bounce TV resumed airing the series in December 2016 but pulled the show on April 26, 2018 — the day Cosby was convicted of sexual assault. TV One began airing reruns of the show in May 2017. It is currently the only American network to offer the series. The Cosby Show's producers created a spin-off series called A Different World that was built around the "Denise" character (portrayed by actress Lisa Bonet), the second of the Huxtables' four daughters. Initially, the new program dealt with Denise's life at Hillman College, the fictional historically black college from which her father, mother, and paternal grandfather had graduated. Denise was written out of A Different World after its inaugural season, due to Bonet's pregnancy, and the following season was revamped, with the addition of director Debbie Allen (Phylicia Rashad's sister) and new characters. Denise later became a recurring character on The Cosby Show for seasons four and five, and a regular again in seasons six and seven. Outstanding Directing in a Comedy Series (1985) – Jay Sandrich for "The Younger Woman"
Outstanding Directing in a Comedy Series (1986) – Jay Sandrich for "Denise's Friend"
Outstanding Guest Performer in a Comedy Series (1986) – Roscoe Lee Browne for "The Card Game"
Outstanding Editing for a Series – Multi-Camera Production (1986) – Henry Chan for "Full House"
1993: TV Guide named The Cosby Show the All-Time Best Family Show in its issue celebrating 40 years of television. 1999: Entertainment Weekly placed show's debut at #24 in its list of the "100 Greatest Moments in Television"
2007: Time magazine placed the show on its unranked list of "100 Best TV Shows of All-TIME"
2007: USA Today's web site ranked the show as #8 in its list of the "top 25 TV moments of the past quarter century"
2008: Entertainment Weekly selected Cliff Huxtable as the Dad for "The Perfect TV Family"
2013: TV Guide ranked The Cosby Show #26 on its list of the 60 Best Series. During the series' run, the character of Cliff Huxtable frequently wore an array of knit sweaters that were often brightly colored and featured abstract, asymmetrical patterns or themes. The sweaters were erroneously thought to be designed by the Australian clothing company Coogi, but were actually designed by Dutchman Koos Van Den Akker. They were dubbed "Cosby sweaters", a term that is used to describe sweaters that are generally deemed garish and unappealing. In May 2008, Cosby's daughter Evin auctioned a batch of the sweaters that her father had kept on eBay. The proceeds of the sales went to the Hello Friend/Ennis William Cosby Foundation, a non-profit charity named for Ennis Cosby. Ennis, Cosby's only son, was murdered in January 1997. The character of Dr. Hibbert, who is featured on the long-running animated sitcom The Simpsons, is modelled after Dr. Cliff Huxtable. The Simpsons writing staff decided to make Dr. Hibbert a parody of Cliff Huxtable after the Fox network moved The Simpsons to Thursday nights airing opposite the top-rated The Cosby Show. In the Teen Titans Go! episode "Oil Drums", Starfire says "I would like to watch The Crosby Pudding Half-Hour Show of Sweaters. Theo, get your glorp-nops off the kitchen table. Rudy!" All eight seasons of The Cosby Show have been released on DVD in Region 1. Seasons one and two were released by UrbanWorks which was subsequently acquired by First Look Studios, who then released the remaining six seasons. Seasons One and Two contain special features, including the ninety minute retrospective documentary entitled The Cosby Show: A Look Back, which aired on NBC in May 2002. It contains interviews with cast members, bloopers, deleted scenes and audition footage. In December 2010, First Look Studios filed bankruptcy, and all its assets were subsequently acquired by Millennium Entertainment, who also took over distribution of The Cosby Show DVD releases. As of 2013, these releases have been discontinued, and are now out of print. On November 5, 2013, it was announced that Mill Creek Entertainment had acquired the rights to the series. They have subsequently re released all eight seasons on DVD. On September 1, 2015, Mill Creek released a sixteen disc complete series set entitled The Cosby Show – The Complete Series. In Region 4, Magna Pacific has released all eight seasons on DVD in Australia and New Zealand. The first two seasons have similar artwork to the North American copies, although season two is red rather than blue. Each Australian cover also features the tagline "In a house full of love, there is always room for more". Universal Studios Home Entertainment has released Seasons 1 to 4 in Region 2 (United Kingdom). Note: The Millennium Entertainment release of season one contains the edited versions of the episodes aired in syndication. However, all subsequent DVD releases (including the complete series set) contain the original, uncut broadcast versions. In 2011, Millennium quietly released season one uncut in Region 1, which featured the special features from The Complete Series set. ^ Meyers, Kate (May 3, 1996). "Cosby's Last 'Show'". Entertainment Weekly. Time, Inc. Retrieved April 2, 2009. ^ Gates, Henry Louis; Higginbotham, Evelyn Brooks (March 23, 2004). African American Lives. Oxford University Press. p. 195. ISBN 978-0-19-988286-1. Retrieved August 6, 2013. ^ Manzo, Ula C.; Manzo, Anthony V. (January 1, 1993). Literary Disorders: Holistic Diagnosis and Remediation. LiteracyLeaders. p. 27. ISBN 978-0-03-072633-0. Retrieved August 5, 2013. ^ Orenstein, Myrna (December 6, 2012). Smart But Stuck: How Resilience Frees Imprisoned Intelligence from Learning Disabilities, Second Edition (2 ed.). Routledge. p. 12. ISBN 978-1-135-80043-7. Retrieved August 5, 2013. ^ Aldridge, Delores P.; Young, Carlene (2003). Out of the Revolution: The Development of Africana Studies. Lexington Books. p. 350. ISBN 978-0-7391-0547-4. Retrieved February 11, 2014. ^ Kovalchik, Kara (April 9, 2008). "5 Mysteries Surrounding The Cosby Show". Mental Floss. Retrieved August 7, 2013. ^ Alston, Joshua (October 24, 2012). "How The Cosby Show spoke to race and class in '80s America". The A.V. Club. Retrieved August 6, 2013. ^ "The Cosby Show: 1984–1992". People. June 26, 2000. Retrieved November 19, 2010. ^ "Sondra Huxtable Tibideaux". TV Land. Viacom. Archived from the original on May 30, 2013. Retrieved August 6, 2013. ^ Alley, Robert S.; Brown, Irby B. (2001). Women Television Producers: Transformation of the Male Medium. University Rochester Press. p. 255. ISBN 978-1-58046-045-3. Retrieved August 5, 2013. ^ Marc, David (1992). Prime Time, Prime Movers: From I Love Lucy to L.A. Law—America's Greatest TV Shows and the People who Created Them. Syracuse University Press. pp. 101–103. ISBN 978-0-8156-0311-5. Retrieved August 5, 2013. ^ McNeil, Alex (1996). Total Television: The Comprehensive Guide to Programming from 1948 to the Present. Penguin Group USA. p. 181. ISBN 978-0-14-024916-3. Retrieved August 5, 2013. ^ "Bill Cosby on 50 Years of Comedy: Forum – KQED Public Media for Northern CA". KQED Public Media. ^ Cashmore, Ellis (August 2, 2012). Beyond Black: Celebrity and Race in Obama's America. Bloomsbury Publishing. p. 61. ISBN 978-1-78093-147-0. Retrieved August 5, 2013. ^ Pope, Kitty (2005). Beside Every Great Man-- is a Great Woman: African American Women of Courage, Intellect, Strength, Beauty & Perseverance. Amber Books Publishing. p. 70. ISBN 978-0-9749779-4-2. Retrieved August 5, 2013. ^ Fearn-Banks, Kathleen (August 4, 2009). The A to Z of African-American Television. Scarecrow Press. p. 90. ISBN 978-0-8108-6348-4. Retrieved August 5, 2013. ^ "TV Show Buildings At A Glance". Archived from the original on June 4, 2012. Retrieved November 21, 2011. ^ Gismondi, Steve (April 16, 2002). Turning Forty. iUniverse. p. 156. ISBN 978-1-4620-8144-8. Retrieved August 5, 2013. ^ Stephens, E. J.; Christaldi, Michael; Wanamaker, Marc (July 15, 2013). Early Paramount Studios. Arcadia Publishing. p. 44. ISBN 978-1-4671-3010-3. Retrieved August 5, 2013. ^ "The Cosby House: Brownstones in Pop Culture". Townhouse Experts Blog. Townhouse Experts. Retrieved August 22, 2014. ^ Bennetts, Leslie. "Bill Cosby Begins Taping NBC Series". The New York Times. Retrieved September 20, 2014. ^ Rainer, Thom S.; Rainer, Jess W. (January 1, 2011). The Millennials: Connecting to America's Largest Generation. B&H Publishing Group. p. 53. ISBN 978-1-4336-7003-9. Retrieved February 11, 2014. ^ Franz, Kathleen; Smulyan, Susan (2011). Major Problems in American Popular Culture. Cengage Learning. p. 376. ISBN 978-0-618-47481-3. Retrieved August 5, 2013. I won't deal with the foolishness of racial undertones on the show. ^ Krabill, Ron (September 15, 2010). Starring Mandela and Cosby: Media and the End(s) of Apartheid. University of Chicago Press. p. 104. ISBN 978-0-226-45189-3. Retrieved August 5, 2013. ^ Etkin, Jaimie (July 9, 2013). "'A Different World' Finale 20th Anniversary: Looking Back On The Show's Famous Faces (PHOTOS)". The Huffington Post. Retrieved August 6, 2013. ^ "Last 'Cosby' show finishes production, to air in April". The Baltimore Sun. New York. March 7, 1992. Retrieved August 5, 2013. ^ Tearman, Margaret (June 30 – July 6, 2005). "Bay Weekly Profile: Bill Cosby". Bay Weekly. Retrieved August 6, 2013. ^ Chandler, D.L. (April 29, 2013). "Rodney King Riots: Rodney King Riots in Los Angeles Began on this Day in 1992". NewsOne. Retrieved August 6, 2013. ^ "Top 10 Pregnant Performers". Time. February 10, 2009. Retrieved October 3, 2017. ^ Cooker, H.C. (January 8, 2015). "Lisa Bonet: The Cosby Show Kid Who Got Away". Retrieved September 30, 2016. ^ Wright, H. Stephen (January 1, 2003). Film Music at the Piano: An Index to Piano Arrangements of Instrumental Film and Television Music in Anthologies and Collections. Scarecrow Press. p. 23. ISBN 978-0-8108-4892-4. Retrieved August 5, 2013. ^ ABC News. "gty_bill_cosby_ll_130617_wg.jpg". ABC News. ^ Anderson, Susan Heller (October 18, 1990). "Bill Cosby has stopped using a mural designed for the opening credits of The Cosby Show". The New York Times. Retrieved August 5, 2013. ^ Wilson, Janet; Kirtzman, Andrew (October 15, 1990). "Kids' Mural Paints Cosby Into Corner". Philly.com. Retrieved August 6, 2013. ^ Whitaker, Matthew C. (2011). Icons of Black America: Breaking Barriers and Crossing Boundaries. ABC-CLIO. p. 193. ISBN 978-0-313-37642-9. Retrieved August 5, 2013. ^ Shaw, Harry B. (January 1, 1990). Perspectives of Black Popular Culture. Popular Press. pp. 134–135. ISBN 978-0-87972-504-4. Retrieved August 5, 2013. ^ "TV's Black World Turns—But Stays Unreal". The New York Times. November 12, 1989. Retrieved November 9, 2010. ^ Havens, Timothy (2013). Black Television Travels: African American Media Around the Globe. New York University Press. p. 80. ISBN 9780814737217. ^ Feldman, Dana (June 8, 2017). "Cosby On Trial: How Sexual Assault Allegations Have Cost Him A Fortune". Forbes. ^ Smith, C. Brian (September 26, 2011). "Great Moments in Sitcom History: A Eulogy (Part 1 of 5)". Kempt. Archived from the original on October 7, 2013. Retrieved August 7, 2013. ^ Boone, Mike (September 26, 1984). "It's humor vs. The Hunk as Cosby, Selleck clash". The Gazette. Retrieved March 30, 2012. ^ "Classic TV & Movie Hits – The Cosby Show". Classictvhits.com. Retrieved March 9, 2012. ^ Fearn-Banks, Kathleen (August 4, 2009). The A to Z of African-American Television. Scarecrow Press. p. 32. ISBN 978-0-8108-6348-4. Retrieved August 5, 2013. ^ Tueth, Michael (2005). Laughter In The Living Room: Television Comedy And The American Home Audience. Peter Lang. p. 165. ISBN 978-0-8204-6845-7. Retrieved August 6, 2013. ^ a b "TV Ratings: 1984–1985". ClassicTVHits.com. Retrieved December 2, 2010. ^ a b "TV Ratings: 1985–1986". ClassicTVHits.com. Retrieved December 2, 2010. ^ a b "TV Ratings: 1986–1987". ClassicTVHits.com. Retrieved December 2, 2010. ^ a b "TV Ratings: 1987–1988". ClassicTVHits.com. Retrieved December 2, 2010. ^ a b "TV Ratings: 1988–1989". ClassicTVHits.com. Retrieved December 2, 2010. ^ a b "TV Ratings: 1989–1990". ClassicTVHits.com. Retrieved December 2, 2010. ^ a b "TV Ratings: 1990–1991". ClassicTVHits.com. Retrieved December 2, 2010. ^ a b "TV Ratings: 1991–1992". ClassicTVHits.com. Retrieved December 2, 2010. ^ Rhodan, Maya (November 19, 2014). "TV Land Pulls The Cosby Show From Its Lineup". TIME Magazine. Retrieved November 19, 2014. ^ "Magic Turns on Cos: ASPiRE Network Cancels Cosby Programming". ^ "Bounce TV Pulls 'Cosby' Reruns, BET's Centric Yanks 'The Cosby Show'". ^ services, Tribune news. "Bounce TV to bring back 'Cosby Show' reruns". latimes.com. ^ "Bounce Pulls 'The Cosby Show' In Light Of Bill Cosby Verdict". Multichannel News. ^ McCann, Bob (2010). Encyclopedia of African American Actresses in Film and Television. McFarland. p. 50. ISBN 978-0-7864-5804-2. Retrieved August 5, 2013. ^ a b "The Cosby Show". Emmys. Retrieved August 6, 2013. ^ TV Guide April 17 – 23, 1993. 1993. p. 20. ^ "The Top 100 Moments In Television". Entertainment Weekly. February 19, 1999. Retrieved October 22, 2007. ^ TV guide: guide to TV. Barnes & Noble. 2004. p. 536. ISBN 0760756341. ^ "The 100 Greatest TV Characters". Bravo. Archived from the original on October 15, 2007. Retrieved April 15, 2010. ^ Poniewozik, James (September 5, 2007). "All-TIME 100 TV Shows". Time. Retrieved August 6, 2013. ^ Bianco, Robert (May 14, 2007). "Did you see that?". USA Today. Retrieved August 6, 2013. 8. 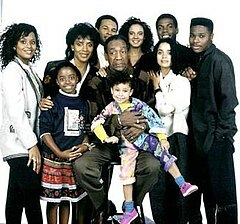 The Cosby Show (1984) This sitcom-savior sparked 20 years of "Must See TV" dominance while spreading a gentle yet powerful message about inclusion, diversity and the universality of real family values. ^ "TV: Breaking Down the List," Entertainment Weekly," #999/1000 June 27 & July 4, 2008, 56. ^ McCall, Tyler (July 8, 2013). "Bill Cosby, His Sweaters, and the Man Who Made Them". Fashionista. Retrieved January 15, 2014. ^ Oatman-Stanford, Hunter (February 11, 2013). "Bill Cosby Schools Us About Those Crazy Sweaters". Collectors Weekly. Retrieved August 5, 2013. ^ Rodriguez, Jayson; Reid, Shaheem (January 14, 2009). "Biggie Took Coogi Sweaters From 'The Cosby Show' To The Clubs". MTV. Viacom. Retrieved August 7, 2013. ^ Simakis, Andrea (December 15, 2010). "Ugly Christmas sweaters are suddenly all the rage". Cleveland.com. Retrieved August 6, 2013. "Cosby sweater" entered the country's vernacular and came to mean a garment so loud and nauseating that those encountering it would be tempted to reach for earplugs and Dramamine. ^ Lane, Mark (December 24, 2009). "Big Book divulges lore of Christmas". The Deseret News. p. A9. ^ "Three of Bill Cosby's sweaters from 'The Cosby Show' to be auctioned online". NY Daily News. Los Angeles. Associated Press. May 30, 2008. Retrieved August 5, 2013. ^ Groening, Matt; Jean, Al; Kogen, Jay; Reiss, Mike; Wolodarsky, Wallace (2004). Commentary for "Bart the Daredevil", in The Simpsons: The Complete Second Season [DVD]. 20th Century Fox. ^ "The Cosby Show DVD news: Announcement for The Cosby Show - Seasons 1 and 2 - TVShowsOnDVD.com". tvshowsondvd.com. Archived from the original on November 10, 2013. ^ "The Cosby Show DVD news: Box Art and Date Change for The Cosby Show - Seasons 3 & 4 - TVShowsOnDVD.com". tvshowsondvd.com. Archived from the original on March 7, 2014. ^ "The Cosby Show DVD news: Announcement for The Cosby Show - Seasons 5 & 6 - TVShowsOnDVD.com". tvshowsondvd.com. Archived from the original on October 28, 2014. ^ "The Cosby Show DVD news: Announcement for The Cosby Show - Seasons 7 & 8 - TVShowsOnDVD.com". tvshowsondvd.com. Archived from the original on April 16, 2015. ^ "The Cosby Show DVD news: Box Art for The Cosby Show - The Complete Series - TVShowsOnDVD.com". tvshowsondvd.com. Archived from the original on June 18, 2015.